From Bear Camp: guests will fly into Port McNeill and transfer to Orca Camp by water taxi. From Vancouver: one can meet on Quadra Island, which is a scenic float plane ride from Vancouver or 10-minute ferry ride from Campbell River. Or you can meet at Way West Coastal Ventures & Water taxi in Campbell River the day of your trip. We highly recommend making Quadra Island a part of your vacation plans. It’s a beautiful laid back island with endless opportunities for outdoor activities, beaches to relax on, amazing accommodations and great local artisans. Rise and shine ready for fun and adventure. After meeting our water taxi and a safety briefing, our captain takes us up Discovery Passage and safely through the infamous ‘Seymour Narrows’, renowned for its treacherous tidal flows and whirlpools. En route, sightings of marine life such as porpoises, dolphins, sea lions and whales are common. After the 2 1/2 hour journey we arrive at our remote wilderness base camp on Blackfish Sound. After settling into our new surroundings and having lunch we will have a kayak orientation and discuss safety procedures before setting off on an afternoon paddle. We will return in time for a fresh wild salmon dinner (alternatives of course for those who do not eat fish). Enjoy the sunset from the hot tub before retiring to rest for more fun in the morning. After a hearty camp breakfast we will meet to discuss our plans for each day. Our route and schedule will depend on weather conditions, wildlife viewing opportunities and group preferences. Generally, we set out in our kayaks after breakfast and paddle to one of the area’s many pocket beaches for a picnic lunch before paddling ‘home’ again in time for some relaxation time before dinner. On our way, we’ll take breaks for stretching and snacks, and we always take lots of time to explore the intricate shoreline. For the very brave there is always the option of a dip into the chilly waters of Blackfish Sound before a restorative soak in the hot tub! This morning we’ll be met by our covered vessel for a 3-hour journey further into Blackfish Sound, Johnstone Strait or Queen Charlotte Strait, giving you the opportunity to explore areas beyond the reach of our kayaks. We’ll return in time for lunch, followed by an afternoon kayaking the nearby waters and islands. This is our last day of exploration on the coast. After a final morning paddle we will pack up our things and soak up the last bit of tranquility before the water taxi arrives and our flights to Bear Camp where we watch for abundant grizzlies as they hunt for salmon in the azure blue waters of Chilko lake and river! As soon as everyone’s gear is stowed, we will board our plane for the incredible flight over the mountains and glaciers. Upon arrival, your bear guides will give you an orientation to the events ahead and we’ll enjoy the first of many delicious meals in our new wilderness setting. Though we are here to encounter nature, the camp environs are also captivating. Your safari tents are built up on large viewing platforms and have either one king or two double beds complete with comfy duvets, indoor/outdoor lounging areas and a view that cannot be beat. The main tent and renovated 1954 trappers lodge are the focal points for meals, cocktails and relaxing. Fine fare is a ROAM hallmark, and our chef creates elegant meals using local and regional natural foods, including abundant vegetables and local herbs. Every morning before breakfast we will start with coffee delivery to your tent. And there’s always a morning paddle or boat ride to watch the bears as the sun rises on the river. Chilko Lake is one of the world’s premiere alpine lake destinations. During your trip you will explore unobtrusively by sea kayak, canoe and boat. Surrounded by massive glacier-capped peaks and a road-less wilderness, you will spend the day paddling the lake and picnicking on sandy beaches. Some may want to hike to Green Lake upon your return while others wish to take in a massage or kick back and enjoy a cold drink and watch the salmon and bald eagles. Before dinner we will do another boating trip to see more grizzlies. The Chilko River lies within an ecosystem that contains some of the world’s best habitat for grizzly bears. They converge in great numbers in the fall (85-100), when millions of salmon return to spawn at the river’s mouth, providing a feast of stunning proportions. Black bears, wolves and cougars also abound in the pine and fir forests. As we float a 10 to 21 mile stretch of the river, flowing directly out of Chilko Lake, we keep an eye out for bears that often visit its banks. Following a picnic lunch, we return later to the camp for some free time or more activities. Mountain bike, kayak, unwind with a book on the deck, or do absolutely nothing but drink in the spectacular scenery. At dusk and before dinner, we board our boats again to look for bears along the lakeshore. After another morning paddle and hearty breakfast, we will leave Bear Camp and get ready for flights home. You should arrive late afternoon but we always recommend overnighting in Vancouver at the end of the trip in case of weather issues with smaller aircraft. ROAM would be pleased to make Vancouver accommodation arrangements on your behalf. 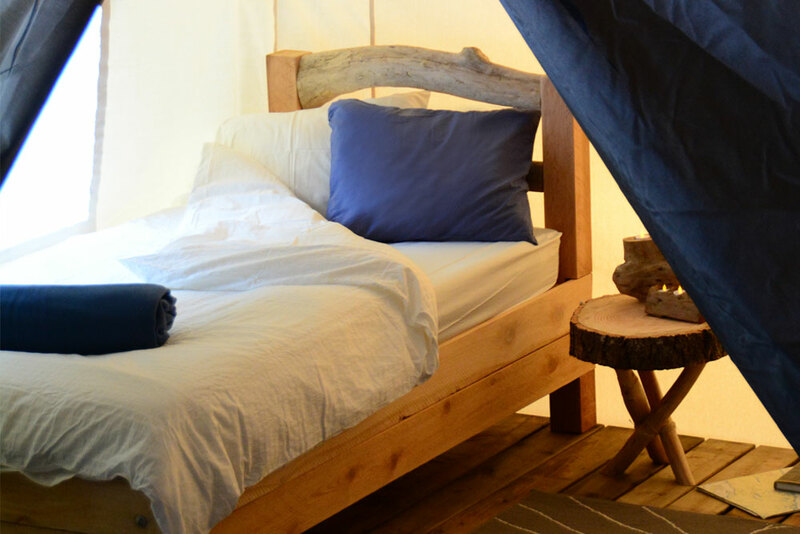 Orca Camp’s tents are large 10×12′ (3×3.6m), bright and spacious cotton canvas tents made on Vancouver Island. They are 8′ (2.4m) high at the peak so have ample room for standing up and moving around with ease. The screened windows and front door provide sweeping views of the forest and and/or ocean. The tents are perched off the ground on cedar platforms, helping to protect the delicate ecosystem below. Inside your tents are 2 twin beds which can be pushed together to make a king size if desired. 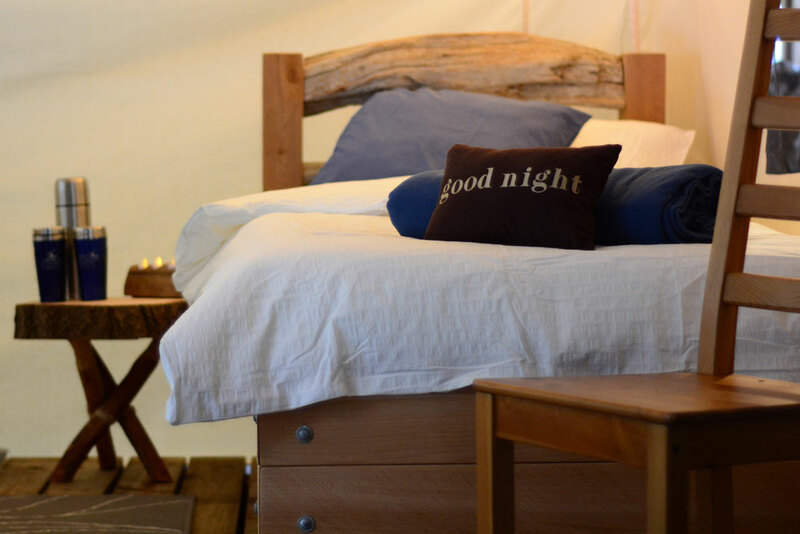 These beds are handmade with locally milled red cedar and beach driftwood accents. The beds each have a 6-inch thick soya foam mattress, 2 pillows (one soft and one firm to ensure a good night’s sleep), crisp white linens, a warm duvet and fleece blankets for those cooler nights. Bedside tables, crafted from local wood, hold a lamp for reading and a hot water bottle to help take the chill off when you crawl into your bed to dream about what’s in store for the morning. Bear Camp is a safari-style interconnected network of elevated decks and platforms, standing riverside on the Chilko River. With eight large 20’x30′ safari tents for a maximum of sixteen guests, you are sure to have all the attention or privacy you want. Your spacious tent in the trees offers either a king or two double beds, with ample room to lounge on comfortable chair sets both inside and out of the tent. Plush down duvets keep you warm at night and power stations available to light up your reading light or charge your camera battery. A 1954 trapper cabin is nucleus of the camp. It’s been transformed to an open kitchen, lounge with wood stove, and a funky dining hall with full open bar. Meals can enjoyed deck-top or in the cabin and there are a total of five full bathrooms with hot showers and flush toilets, all close to the main cabin. Thank you for choosing a ROAM whale and bear watching adventure. 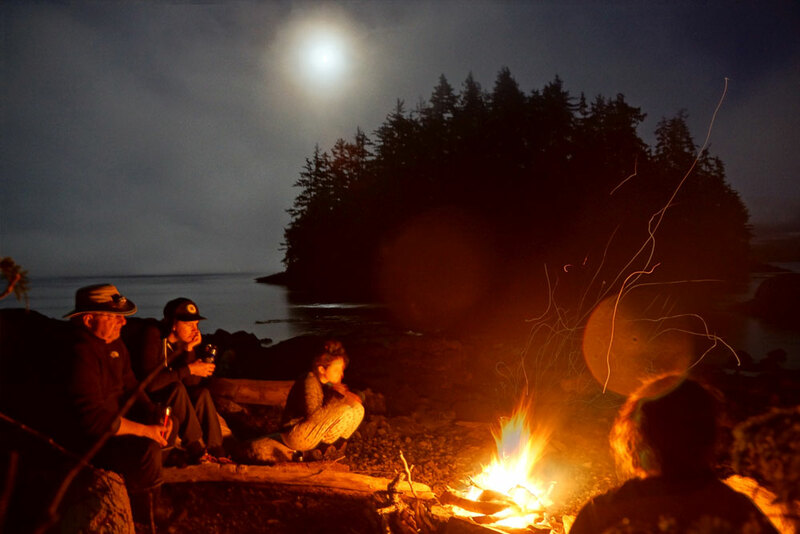 We are very excited that you will be joining us as we explore the pristine archipelago off northern Vancouver Island in British Columbia and the interior coastal mountains and lakes. 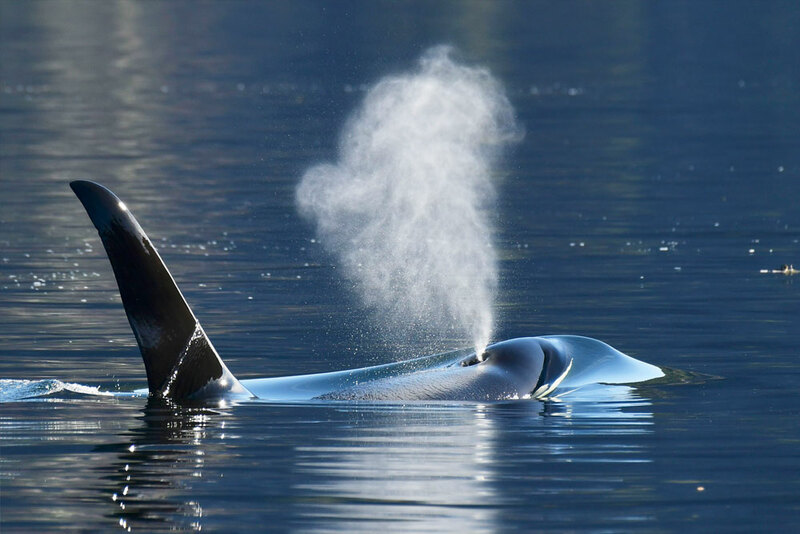 The Johnstone Strait is internationally recognized as the best location to see orca whales in the wild, as nearly 300 orcas (or killer whales) congregate here. You may find yourself paddling just yards away from these magnificent creatures. But there is more to the Johnstone Strait than just whales. The pristine beauty of its rocky shores, many coves and tidal inlets are teeming with marine life of every kind. Ocean kayak touring is among the fastest growing leisure activities in North America, and its popularity is easily explained. It is a means of discovery that is accessible to people of all ages, and on our trip no previous kayaking experience is necessary. The Johnstone Strait is located at the northern tip of Vancouver Island, and is an extension of Discovery Passage, one of the most popular navigational routes for cruise ships heading north to Alaska. The waters are protected from the rough Pacific wind and waves found further to the west. The Strait consists of a large archipelago of islands set to the backdrop of the snow-capped peaks of the mainland Coast Range. Beaches, sandy dunes, and rocky headlands dot the landscape. What makes this region so popular is its elaborate network of coves, inlets and channels that provide intimate and inspiring kayaking. Along the shore are dense cedar forests and a tidal environment flourishing with marine life. The amazing clarity of the water makes for exceptional viewing. The shores also possess a rich cultural history. Nearby is one of the highest concentrations of archaeological sites belonging to the local Kwakiutl Nations. Our kayaking is made easier without the need to carry any equipment and provisions in our kayaks. Support boats transport all of our supplies while we spend the days simply enjoying the wildlife and exquisite seascapes. Chilko Lake is nestled among a ring of mountains. The lake is fed by dozens of mountain creeks and is located in a rugged and relatively untouched wilderness region, covered in tall mountain ranges, stunning waterfalls, eternal glaciers and green pine forests. The 180 km2 lake is located on the Chilcotin Plateau, and the glacial valley on which it can be found opens onto a large lava plateau, which lies inland from the highest section of the main mountain range nearby. The peaks bordering Chilko Lake are among the tallest in British Columbia. Mount Good Hope, with an elevation of 3243 m and Mount Queen Bess, with an altitude of 3242 meters are two of the most important peaks close to the lake. Two deep and large glacial valleys connect the Chilko region to the Taseko Lake, which drains towards the north, parallel to Chilko River. Both of them end up in the Chilcotin River, a main tributary of the Fraser. This area is referred to as the Chilcotin-Fraser Drainage Basin. The area between the Chilko and the Taseko Lake basins is a protected area, administered by the Xeni Gwet’in, made up of residents of the Nemaiah Valley and the Tsilhqot’in people. The area is mostly covered in Douglas fir forests on lower elevations and dry alpine vegetation on higher grounds. Grizzly bears, wolverines, bald eagles and mountain cats make up the most frequently-seen animals of the park. There are, however, a few ecologically sensitive species such as the California bighorn sheep.